Being the dapper fellow that you are, you know that a watch is an important item to own. No doubt you have one or more in your arsenal already. But what are the differences between watches, especially those that make one more expensive than another? What maintenance is involved to keep your watch at its best? What should you know when shopping for a new timepiece? Our detailed watch section shall assist you in all different aspects of watches, so you can be a more informed man (or woman) in the wonderful world of horology (which is the art and science of measuring time, by the way). Overview of the History of Horology. Outer Watch Part Basics 101. Before we go over any movement options, let’s start with a rudimentary breakdown of a watch’s parts. The graphic below shows the elements that nearly every watch will have. The case holds the inner working parts of the watch. Depending on the style of the watch, the case is usually made of stainless steel, because steel is resilient, handles light shocks that the watch could receive, and doesn’t tarnish. Cases can also be made of precious metals like gold or platinum, and can even be made of plastic in sports watches. The case can also come in different ﬁnishes like high-polish, smooth, matte, or a combination of any of those. The case also contains the movement itself, be it electronic (quartz) or automatic (self-winding). We’ll cover more on movements later. The crown is what is used to change the time. Some watches offer a date window and a seconds indicator, which are engaged by pulling the crown out. Crowns on water-resistant watches screw down into the case. The crown can have embellishments like precious stones, to indicate luxury and attention to detail. The strap/buckle secures the watch to your wrist and there are a number of materials commonly used for these parts. Leather straps range from calfskin to lizard and more exotic offerings like ostrich, alligator, crocodile, and even toad. Instead of a strap, a metal bracelet is a popular option. Other options are nylon straps (for sportiness), satin straps (for dressiness), and rubber straps (for diving/watersports). Most watches allow straps and bracelets to be interchangeable so you can dress it up or down when you want to change the look of your watch. We have several articles on watch straps which can be found here. The bezel is the outer ring of the case that connects to the lugs. It is typically a ﬂat-edged surface, but can also be rounded. The bezel can also have embellishments, like precious gemstones in upscale watches, and may be a different metal than the case itself, as in some two-tone watches. The above pictures show three different kinds of watch bezels. The one on the left rotates, allowing the user to “set” a different time zone. While the other two are fixed, such as the “fluted” bezel on the middle Rolex watch, and rounded one on the right Jaeger-LeCoultre perpetual calendar timepiece. Looking to learn more about bezels and their scales? Head to our dedicated watch bezel guide! The dial is where the watch can be the most expressive. It is the ﬂat surface beneath the crystal, and can come in many color options, textures, and materials. Dials can use Roman numerals, Arabic numbers, or even more simple stick bar markers to indicate the time. The most basic watch function is where it tells the time only. These kinds of watches are considered the most “dressy” / formal of all watch types. Anything in addition to the time is considered an added “complication” to the watches function, and thus the term. Below you’ll find some of the most popular watch complications and what they mean. This indication on the dial can also be referred to as the day/night indicator. This allows you to see what time of day it is, based off of an image of the sun and moon. This function is especially helpful when found on a dual-timezone watch as you will be able to see the time in a different timezone and always know the time of day. There are even some 24 hour movements (where the hour hand only rotates once per day), such as the one seen below in the vintage WWII Bulova watch. This calendar function displays the day, date and month, and typically also includes the year. Unlike the Perpetual Calendar, this function needs to be adjusted at the end of February, as it does not account for leap years. Found on a quartz watch, the second hand typically will jump in two to four minute intervals rather than every second. This function will alert you before the watch loses power. A Standard Calendar function, rather than an Annual Calendar or Perpetual Calendar, will show you the date and the month depending on the complexity of the movement. Occasionally, more complex movements will also show the day of the week. A chronograph makes it possible to measure continuous or discontinuous intervals of time. Typically a chronograph records from a fraction of a second, up to 12-24 hours. These are typically recorded in three sundials and are usually operated by two additional pushers surrounding the crown, but can also be found in a single pusher. To learn more about the different types and how they can be used, head to our detailed chronograph guide. This function is primarily found on dive watches. Once a diver reaches a preset depth, an alarm sounds or vibrates. Considered part of the calendar family, a date window will be the only numbers found associated with the date. Popular places to find the date window are: 3 o’clock, 12 o’clock and 5 o’clock. A helpful complication for those who like to travel or have family located in a different timezone, this measures both the current local time and typically at least one other time zone [Watches such as the Rolex GMT Master II can even track three times at once, see GMT below]. This can be found in a second dial, an extra hand, or in a subdial. Dual time can also be called a “world time” function. GMT stands for Greenwich Mean Time, which is the international standard of time that the world is set to. Similar to dual time, a GMT function is primarily found as a second hand and reads in a 24-hour mode to determine day from night. A secondary set of numbers is found in the bezel or around the outer rim of the dial depending on the model. This beautiful function refers to a watch that strikes a bell to chime the time. This function happens automatically like a grandfather clock or a large clock in a town center. A Grand Sonnerie strikes the hour, quarter hour and minutes. A Petite Sonnerie strikes the hours only. Found as a part of diving watches that can dive deep into the ocean, a helium escape valve releases pressure that exist in extreme depths of the ocean. This avoids damaging the watch or popping the crystal due to excessive pressure. Unlike a Grand or Petite Sonnerie, a minute repeater chimes the hours, quarts and minutes at the push of a button. Shown in a window on the face of the dial, a moon phase function will show the waxing and waning of the moon as it circles the earth. This allows you to watch the different phases of the moon both in the sky and on your wrist. This complex calendar function takes into account the different lengths of the month, including February, and is accurate until year 2100 [For some watches you can even buy the correct gearing out to the year 2400, such as the IWC Davinci]. This shows the day, date and month, but also includes the moon phase and year as added functions. Similar to the end of life indicator on a quartz watch, the power reserve indicator will show the remaining time until the watch stops running and when it will need more winding. 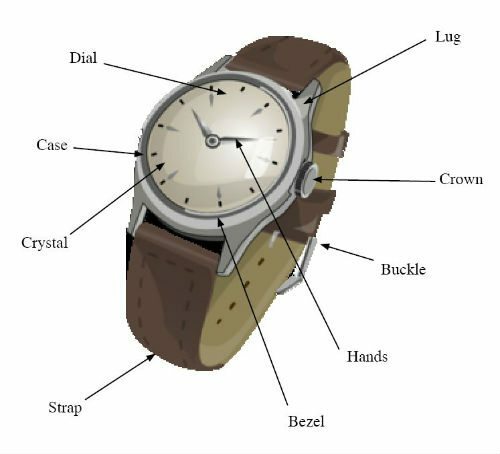 This is found on manual-wind watches primarily, but can also be found on an automatic, self-winding watch. Another name for a power reserve is the Reserve de Marche. This additional complication shows the sun and the moon rotating on a disc, visible through a small window, showing the different time of the day in relation to the sunrise and sunset. A 24-hour dial or two tone bezel can also show off the different times of day. Found in addition to a chronograph, a tachymeter measures the speed over a certain fixed distance, such as a mile. Check out our full guide to tachymeters to learn how one works and how to use it. Invented in 1801, a tourbillon was designed to eliminate errors in watches when watches change position in relation to the wrist movement. This consists of a cage surrounding the parts of an escapement, with the balance wheel at the center. A tourbillon is typically found as a cut-out on the dial which allows for viewing of the movement. For a more in-depth look at the three types of watch movements, see our simple breakdown of watch movements. If you have a quartz watch and need to change the battery, view our guide on changing a watch battery. 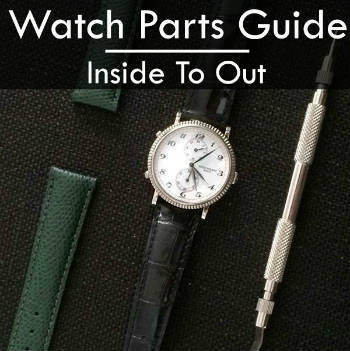 Below we’ve covered the major working elements / terms of a watches inner workings. The balance spring is a very fine spring in a mechanical watch that causes the balance wheel to recoil. The spring coils and recoils to swing the balance wheel which then regulates time. The balance wheel is the second element to regulate time and is attached to the balance spring. As the balance spring coils, the wheel oscillates and divides time into equal segments. This mechanism regulates the accuracy and works the same way as a pendulum. Affecting the length of the power reserve on a watch, the barrel is a drum which houses the Mainspring. Some watches feature a double barrel which creates an extra-long power reserve. A bridge is fixed to the main plate, thus forming the frame of a watch movement which houses all other parts. Originally, the caliber denoted the position and size of its components. Today, a caliber refers to the movement number, origins or its manufacturer. An escapement is one of the most important parts of any watch. This piece maintains the oscillations of the balance wheel, which then lets the wheels and hands revolve. A gasket is a small ring used to create an air-tight seal. These rings are located around the caseback, crystal and crown to protect against water. Gaskets are typically rubber and should be checked every few years to maintain water resistance as the rubber can wear out over time. While not a physical part of the watch movement, the Geneva Seal is a stamp on the movement. This seal is awarded by an independent bureau in Geneva. Each movement that is submitted to the bureau undergoes 12 different tests related to the quality, finish and materials. These movements must also be manufactured in Geneva. A trademarked term referring to the shock-absorbing mechanism, this small piece is used in mechanical watches. The Incabloc prevents damage to sensitive parts during a fall. A jewel is a real ruby, or a synthetic gemstone, that reduces friction in the gear trains. This helps to maintain accurate timekeeping while greatly reducing the wear on parts, thus increasing the longevity of the watch itself. The main plate is the primary piece of metal that holds all the other parts of a movement together. Each part is mounted into the main plate. The mainspring is a coiled spring giving power to the gear train. This tightens and unwinds to create movement. A repeater is a complication that strikes like a gong. This can strike the hours, quarter hours and minutes using a gong. This complication is typically started using a button or slide on the case to activate. The rotor is the oscillating part of an automatic watch. This moving part winds the mainspring, which allows a watch to be wound automatically, rather than manually as the wearer moved. The shock absorber captures the shock from the balance staff, protecting pivots from being damaged inside the movement. This is especially important on sports models. A tourbillion is created when the balance wheel and escapement are mounted inside a rotating cage. These two parts of the movement can then rotate completely to avoid errors caused by the rotation of one’s arm. The tourbillion typically rotates once per minute, but some manufactures produce them with four or six minute rotations. This is an extremely complicated movement which is hard to produce. What you use to adjust the size of the strap when inserting the buckle arm. To close the strap and hold it around the wrist, there is a buckle. Different buckles include a tang buckle, which looks like a belt buckle or a deployment or folding buckle. The free loop is the extra loop found on a strap next to the fixed loop. The free loop can be moved around the band of the watch. Both loops are used to fasten the excess band to the wrist. The loops that you pass the strap through to “keep” your strap / band in place. A lug hole is where you insert the spring bar to fix a strap or bracelet to the watch. Each lug has holes where a spring bar will fit. To attach or detach a spring bar, a tool will be needed. Bracelets are made from metal, and are typically made to be “flush” with the watches case and lugs. A deployment buckle is a tri-folding buckle that has pushers to release the clasp. Depending on the style of the bracelet, this can be a hidden buckle or similar to a folding buckle. Note – this type of buckle can also be found on straps, especially higher end ones, as it saves on wear and tear of the material used for the strap. A folding buckle, like the deployment style, is tri-folding. This buckle does not have pushers to release the clasp, but rather, typically features a folding bar to hold in place. A metal bracelet is created using links held together. These links can be added or removed to create the perfect sizing of a metal bracelet. Similar to a link, a milanese style bracelet is a metal bracelet. To create this style, small metal pieces are looped together to create a mesh. This mesh was originally designed to have the look and feel of leather while being breathable. This style was originally designed in Milan, which is where the name Milanese is derived. Horology, which is both the philosophical study of time and the practical art of keeping it, has long lent credence to arguments for the existence of God. A pocket watch circa 1810, as it would have looked in William Paley’s time. Transposed into a contemporary vocabulary, the argument relies on a description of a watch’s “irreducible complexity,” the fact that it is made up of many parts and, if one were to remove any one part, the watch would fail to function. This quality is then stated to result from the intent of an intelligent designer, the craftsman who created the timepiece. An analogy is then constructed between the watch’s “irreducible complexity” and that of the natural world, which is a concatenation of linked, and interdependent, elements. From the complexity of the world (or universe), we can then derive the existence of a universal “artificer,” namely God. François-Marie Arouet, known as Voltaire, was an important philosoper during the French Enlightenment. “Irreducible complexity” is a fairly new concept, proposed by biochemist Michael Behe in his 1996 book Darwin’s Black Box, which argued against Darwinian evolutionary theory. Behe’s arguments have been subject to several compelling critiques. For one, Behe’s presentation of “irreducible complexity” assumes that the elements within an irreducibly complex system (like a watch or the universe) have always been necessary. It’s apparent that the elements must be necessary at the point of analysis, because you can’t remove any of them or the system will fail. But it’s not apparent that the elements were always necessary; perhaps they were simply advantageous at first, and then became necessary components of the system over time (as evolutionary theory would dictate). Influential atheist author Richard Dawkins rebutted Behe’s claims (and the watchmaker argument) by arguing that he conflates evolutionary complexity, which depends on the passage of traits between individuals and allows for their further complexity over time, and the complexity of inanimate objects, which can’t. In a way, Dawkins uses horology (in invoking complexity over time) to disprove horology (the watchmaker argument). If you enjoyed this article you’ll find many more in our Bespoke Unit Watch Center. We are striving to create the most in-depth resource on the web regarding watches and watch brands (for the noob to the expert) in a logical, easy-to-access fashion. Further, you can read our latest reviews and topical watch posts in our blog’s Watch Category.